Music Monday: What Makes for Greatness in Rock Music? The inestimable Larry Kaufmann recently made the case in this space that Bob Dylan’s Bringing It All Back Home was pop-rock’s most influential album to date. Dylan certainly is The Man, when it comes to rock and roll influencers. I, too, own all his albums (CDs, cassettes, whatever) and possess a veritable five-foot shelf of books dedicated to the Hibbing, Minnesota, bard. Dylan’s album is undeniably important, and Bringing It All Back Home (BIABH) could very well be his personal best. But whereas Kaufmann makes a good case for it as the most influential album even, I still find myself thinking about what might be the best rock album of all time,. That covers a lot of ground, including such masterworks as Van Morrison’s Astral Weeks, your choice of Beatles albums, Elton John’s Honky Chateau or Goodbye Yellow Brick Road, Bruce Springsteen’s Darkness on the Edge of Town, the Rolling Stones’ Exile on Main Street, Jefferson Airplane’s Volunteers, and … oh, heck, somebody will surely make a case for any five-star album in the Rolling Stone Record Guide. Criteria for judging whether any creative work enters the pantheon of greatness include many things. The mercurial rock critic Lester Bangs, for example, could judge a work by Charles Mingus great by applying a completely different set of aesthetic criteria than he would employ for arriving at the same conclusion regarding an album by the Velvet Underground. And as much as this writer appreciates BIABH, he finds it, like many great Dylan albums, missing a certain cathartic quality, and I find that perception of the album’s lack of catharsis to be a barrier to classifying it as the best in any musical category. In other words, as great as BIABH indeed is, it’s not one of those albums I can slap on the turntable at any given moment and appreciate its greatness. Nor would one discern the strains of “Love Minus Zero/No Limit” at the mall, stop, and say, “Wow!” BIABH is great, alright, but it’s appointment music that doesn’t lend itself to spontaneous appreciation. You have to put some effort into appreciating it fully. Hence, I find the whole concept of musical taxonomy baffling. As an aside, I have never found music publications’ “100 Best…” lists to be fruitful. However, I do remember when magazines like Rolling Stone would put together cool lists of what its editors enjoyed over an extended period of time. In the issue celebrating Rolling Stone’s first decade, for example, several critics listed their favorite recordings–not necessarily the best, in their opinion, but musical moments that stood out for them over the course of a 10-year period. Meaning, the music they really enjoyed. It reminds me of another worthwhile Rolling Stone effort, a book about what single album a particular critic would take with him (for they were all male) on a desert island. This all reminds me of a conversation I once had with a prominent music critic in the Detroit area. I asked him why he measured every contemporary blues recording against Robert Johnson’s body of work, for by that standard even the greatest effort by most blues artists would fail miserably. “You know,” I explained, “Hoodoo Man Blues is a great album, too, and Buddy Guy and Junior Wells are vastly different artists than Robert Johnson but no less important in the blues genre.” It also helped my argument to point out that, at the time, both Guy and Wells were alive, whereas Johnson had shuffled off the mortal coil decades earlier. The critic in question shortly thereafter, not coincidentally, took an extended, years-long hiatus. All this, admittedly, is woolgathering for an arts writer with little musical training and far less musical talent. I agree with Kaufmann that BIABH is a great album, but my go-to for the oh-so important catharsis provided by much great rock music is the Who, which is celebrating a half-century anniversary of its debut release this year. The Who Sings My Generation runs the gamut of youthful emotions dosed with heavy dollops of testosterone and a musical palette derived from an entirely different set of American influences, primarily rhythm and blues. To give the album its full due consideration would take a whole other post, which I intend to write in the near future. 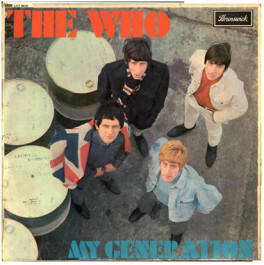 For the time being, however, I’ll leave you with this: The Who Sing My Generation is as great as BIABH, in my humble estimation, but in vastly different ways, and any respectable rock collection includes both albums. Bruce, nice article, and thanks for the positive words on the BIABH piece. I agree BIABH qualifies as “appointment music” rather than something with an immediate, cathartic charge – and as you say, any good record collection should make room for both. The (somewhat) ironic thing about BIABH is that while it may not generate emotional release/catharsis, it did lead to an immense amount of creative liberation, because a lot of musicians WERE listening carefully. My piece looked at influential albums that impacted and inspired other musicians, so “catharsis” wasn’t directly relevant, but it obviously matters to listeners more generally. And speaking of catharsis, how do you think The Who in 1965 compare to Elvis in ’54-55 or the Beatles in ’64?